Evelyn and Mike Platero are a husband and wife team of silversmiths. Evelyn is Zuni and Mike is Navajo. They are particularly known for their rings, earrings and pendants. 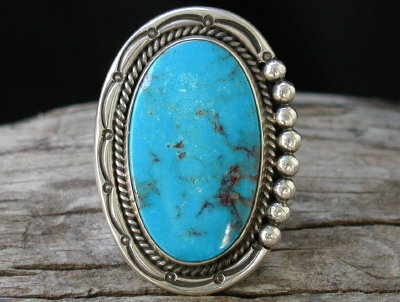 This ring is set with a large oval of stabilized Kingman turquoise from Arizona. Stone: 1 3/8" x 13/16"
Ring face: 1 3/4" x 1 1/4"